Alas, all good things must come to an end and so it is with Southern Italian volcano tours. Yesterday I made it up Etna as far as you are allowed to go, about 3,000 meters (the top is a bit above 3,300, but it’s closed due to some recent eruptions). The wind blew heavy most of the time with gusts reaching 70 kilometers an hour, according to the weather report, enough to knock over somebody weighing 74 kilograms. 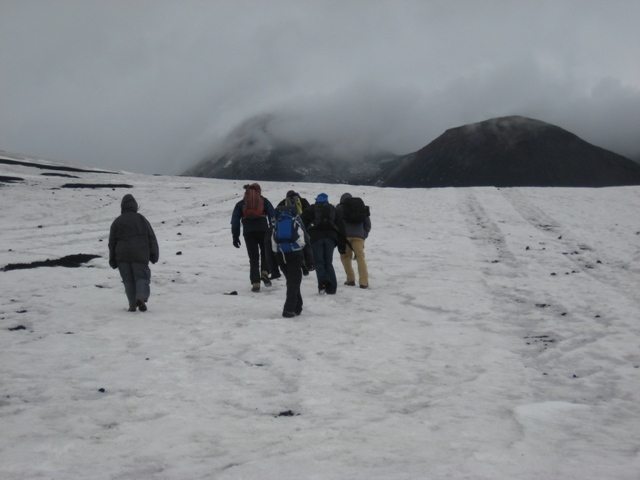 Despite the dodgy weather and the occasionally extreme conditions, it was an excellent walk almost entirely through hard-packed snow. Even from my close up view from right under the peak for several hours yesterday, the peak remained obscured the whole time by cloud cover giving the illusion that I was at the top of the mountain. Today, of course, it has been clear with Etna’s peak visible from Catania. In the late afternoon a huge plume of smoke emerged from one of the top craters in what is sixth eruption this year. 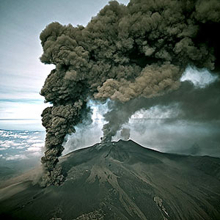 It is with a bit of regret that I read the eruption is not expected to cancel any flights out of Catania today. Guess the volcano tour is really over. I will update with a link when my article is published. Sounds like a neat experience on the volcano. I flew out of Catania on April 8th. I also was half hoping that a volcano would cancel my flight! Catania grows on you quickly, doesn’t it? Had the wind been blowing just a tad differently yesterday I might still be there. What were you doing down there in Catania? Actually, we just flew in an out of Catania. We only had 7 days, which wasn’t quite enough time to see the whole island. But at least I got to snap a few photos of Etna! it right, it’s just insane there. And not only is their drnviig crazy, they never stop for pedestrians at the crossing. You have to make a few steps from the sidewalk to the road itself, then someone might stop to let you walk over to the other side. Otherwise no one cares and just buzzes along. Loan companies will probably demand some type of building inspection to grant funds, but regardless of if they only need the most elementary of checks it is shrewd with a business property to get a specialist survey, if you will be housing a staff there or inviting patrons to go to, you are going to need to ensure for reasons of insurance that you have confirmed the building’s safety. Finding out that your business property has structural faults is totally different from determining the same about a domestic dwelling, anything that delays you having the ability to trade is cash down the john, having to fix things before you move in could mean dear rent being paid along side a new mortgage or a unhomed business which has to keep its doors closed till it has somewhere to work from, all of which can be very dear, indeed many companies have failed waiting for necessary building work to be finished. What risks exist that will build a reduction, and does they be covered by the insurance? A risk is a thing that causes reduction, such as for example temblor in a householder’s QuotesChimp or larceny in a auto coverage. Risks vary from spot to location and from protection to protection. This being this, you likely do not want to purchase protection for a thing that provides you with little if any danger of reduction.